FAQ: Handling Sales Objection eBook $31 - Free Email Support! 2. How many common sales objections and sales rebuttals are included this eBook? There are currently 113 common sales objections and 192 Sale Rebuttals in this eBook. 3. What is an Account I.D? After you submit your secure one-time payment through our secure online payment system you will instantly be able to download "113 Common Sales Objections - 192 Clever and Savvy Responses." Each download includes a unique Account ID that allows you to contact us anytime! Use this ID in the contents of your email (you will be provided with a special email address with your download purchase) when you have a question concerning the contents of this ebook. You will receive a response within 72 hours. 4. Your techniques sound interesting, but I'm just not sure I could pull it off. If you have already made up your mind that you cannot do something then you will not do it. This is an excellent and well-crafted objection handling eBook and only works if you have both a positive attitude and confidence, if one of these traits are missing then this eBook is not for you. 5. How long does it take to get my eBook? 6. Free Unlimited Email Support? What does that mean? If you see a common sales objection that is not included in this eBook then you may email Mr. Cold Call with your question at anytime. You will receive an email response from Mr. Cold Call within 72 hours. A special email address will be provided to you in your eBook download. 7. Is there a money-back guarantee with this eBook download or what is the guarantee? The 100% guarantee that we offer is not a money-back guarantee, but rather a guarantee for email support. In other words, Pop Icon Mr. 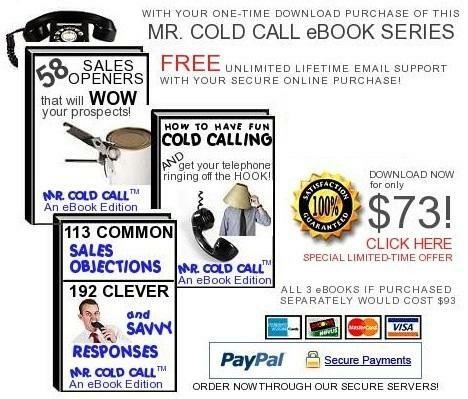 Cold Call™ guarantees that you will be completely satisfied with this sales objection handling eBook purchase that if you see a common sales objection that is not included in this eBook then you may email our customer support (a special email address will be provided to you within the contents of your eBook) with your question and receive a response within 72 hours (each eBook has its own unique Account I.D. Number that you can use to email customer support). This email support guarantee has absolutely no expiration date. 8. May I resell this eBook? Absolutely not! This eBook is copyright protected. Mr. Cold Call™ has retained legal counsel to deal with future issues that may arise. 9. May I split the cost and buy it with another co-worker? 10. Can I call you? All customer support for this eBook is handled via email, however, you may contact us by telephone if you have additional questions. Click here to reach us by telephone! 11. How good is this eBook? Maybe you should ask how GREAT this eBook is! What does good mean? Mr. Cold Call has invested the proper amount of time and research into making this an exceptionally well written eBook. The objections and sales rebuttals included this eBook are constantly being updated each year (every six months) and as a result, you can be assured that you are receiving the most current cold calling techniques to open your sales calls. So inconjunction with these updates and with the right attitude and confidence you will without a doubt increase your call to contact to sales ratios! 12. What happens if I see something that is not included in this eBook? See the answer to questions 6 and 7. 13. How often may I email you? 14. What types of sales objections are included in this eBook? This eBook includes 192 clever and savvy responses that can be applied to any industry, product or service. View these common objections! In order to effectively use these sales responses on your calls then you will need to read them over several times so that it doesn't come across canned. Once you practice and become comfortable with these reponses they they will not sound canned, but rather they will sound more natural. If anything, the rebuttals included in this eBook will give more ideas than you had before and you will absolutely love it! Mr. Cold Call has spent years preparing and fine tuning this eBook. If you have the right attitude then these clever and savvy responses will work for you and help you to close even more sales! 16. How will my eBook be delivered? What kind of software do I need to read my eBook? After you submit your secure online payment you will be asked to click on a button called "RETURN TO MERCHANT." You will then be directed to another page where you can instantly download your sales objection handling eBook. This eBook is viewed in what's called PDF format and you will need a FREE software program called Adobe Acrobat Reader to view this type of format. A majority of computers already have this software program installed; If you do not have this FREE software program then please visit www.adobe.com and then click on the yellow button called "Download Adobe Reader" to download the most current version of this FREE software program. 17. Is www.mrcoldcall.com a secure website to make an online purchase?